These are good quality bright and shiny silver-colour alloy, with a traditional 'fish-hook' fastener. They are nickel, lead and cadmium free, so no allergies or toxicity to worry about and they'll give your necklace plenty of rhinestone sparkle! 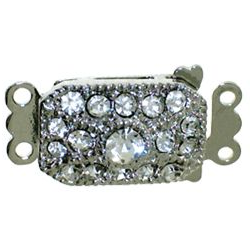 Please choose Round or Rectangular, from the drop-down list, or e-mail us if you'd like us to replace a clasp on your necklace.